Awhile back, I stumbled on to the artwork of Melissa Thomas. I really wish I remembered how I found her. Then maybe I could do it again, and with any luck find more art that’s this much fun! Thomas’ work is clearly inspired by some of the classic Disney animated films. You can easily see one of her characters walking out of Beauty and the Beast, Aladdin, or Mulan. Thus, it’s fitting that she so often uses it to depict characters from the Star Wars and Marvel universe. Below are a few of my favorites among Thomas’ work. For more, I would encourage you to check her out on Behance, Instagram, and Twitter. She also has a store over at Society6. Obviously this one is much more refined. 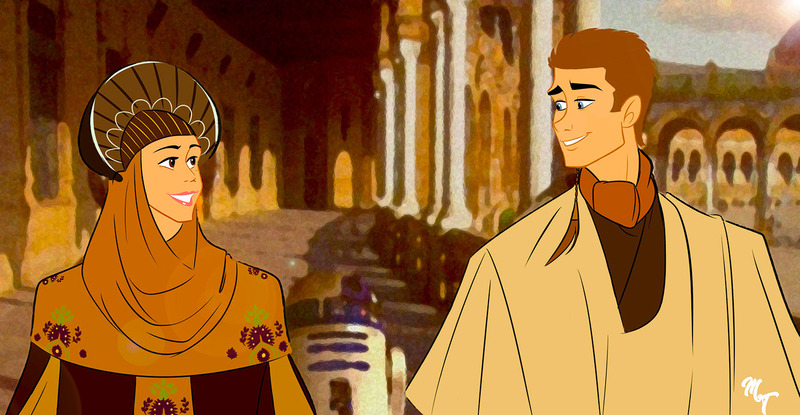 We have a filter over an actual still from Attack of the Clones, with Thomas giving us her take on Anakin and Padme. For yours truly, the sharper angles in the facial structure evoke some of the newer movies, as opposed to some of the classics. 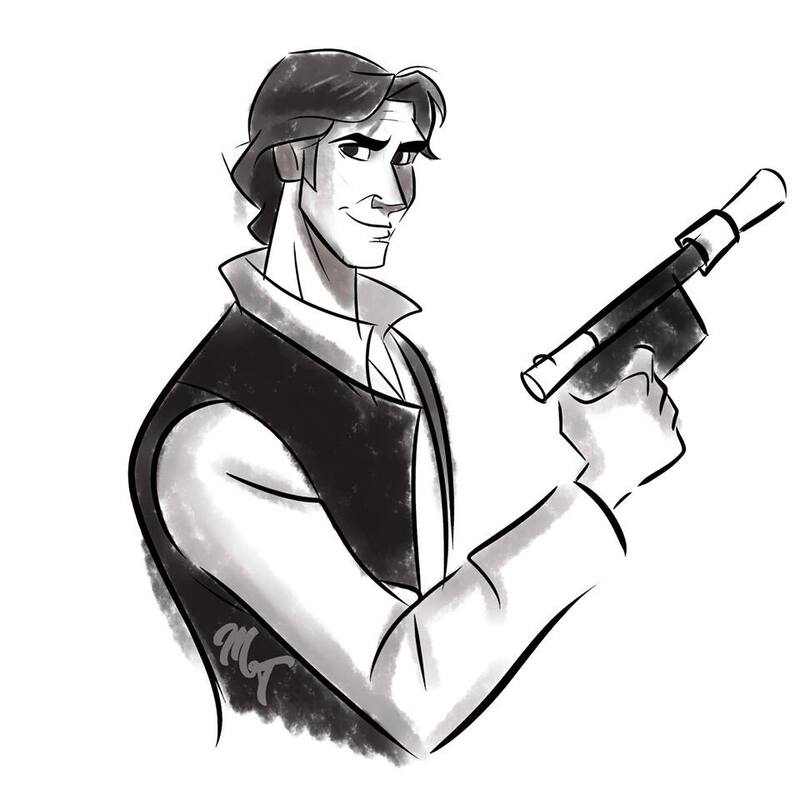 Anakin is giving me bit of a John Smith from Pocahontas vibe. That Disney romance charm is definitely there, though. She the refined product of royalty, and he the boyish charmer. If only Hayden Christensen had been allowed to be this likeable. The premise of this one is interesting to me. 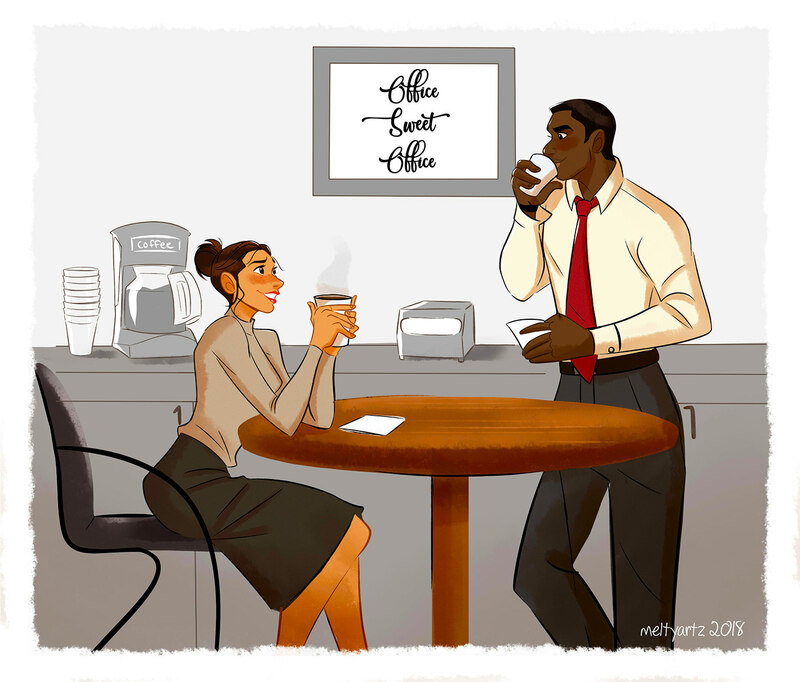 Rey and Finn in an office setting. Two Star Wars characters in a setting that’s not at all like Star Wars. We’re almost journeying into alternate universe territory. This one actually reminds me of Paperman, the black and white short they put in theaters with Wreck-It-Ralph. Paperman is in black and white. But go watch it, and hopefully you’ll see what I mean. 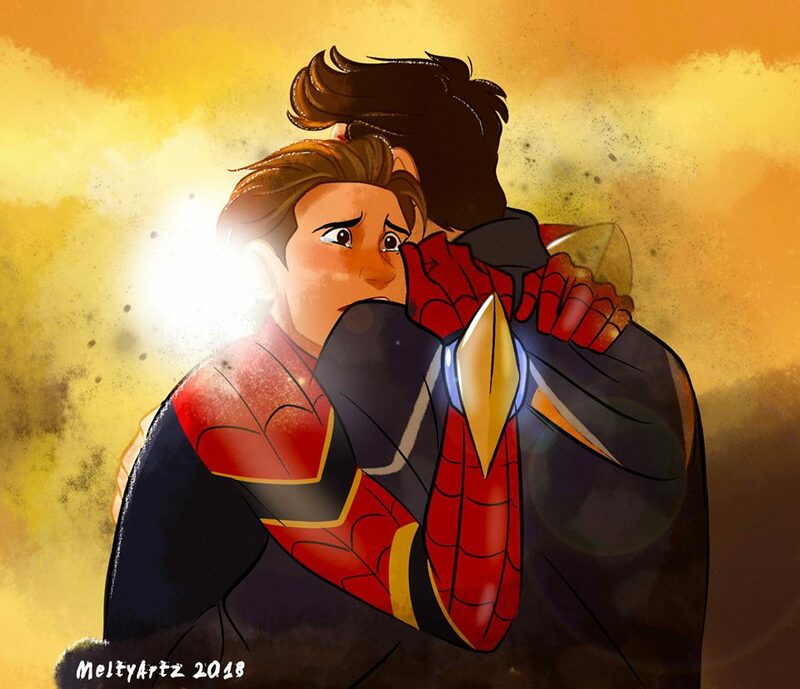 We’re venturing into Marvel territory here, as Thomas captures the heart-wrenching goodbye we saw from Peter Parker in Infinity War. The big, tear-filled “Disney eyes” literally make the whole image. Thomas gives the piece just the right amount of emotional gravitas, without going too far. Peter is going away, but he doesn’t necessarily have the time to really process it. And just as he starts to process it, he fades away. Beautiful. This last one is a simple sketch. An older one, at that. 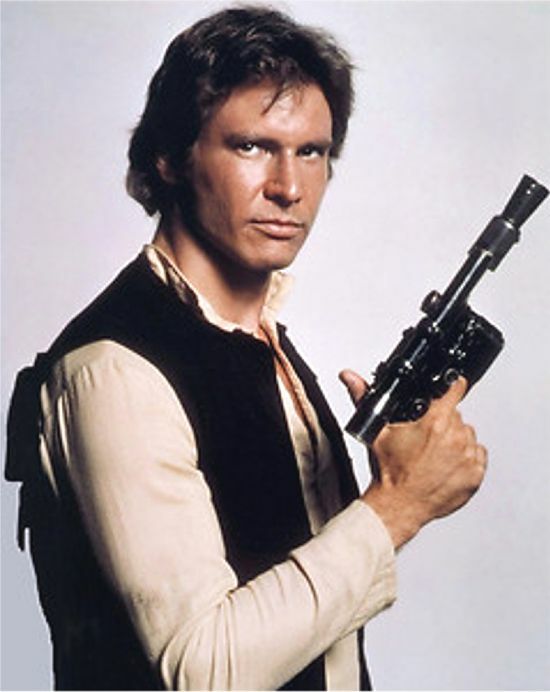 It’s based on a famous promotional shot of Harrison Ford for the original Star Wars. I’m comparing the live image to the sketch because the latter is a perfect illustration (no pun intended) of how Thomas captures a character’s essence, while still maintaining her own style. In the photograph, Ford is playing it cool. He’s emotionally inaccessible. Thomas, on the other hand, gives Han a little smile. He’s every bit the charming rogue he should be. But the smile gives it that touch of Disney magic that Thomas is going for. So simple, yet so effective. 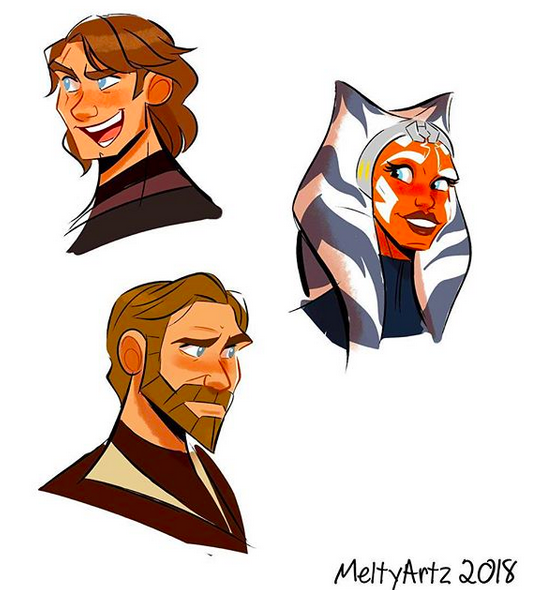 This entry was posted in Astonishing Art, Comic Books/Graphic Novels and tagged Anakin Skywalker, Ashoka Tano, Astonishing Art, Avengers: Infinity War, Disney, Disney Animation, fan art, Finn (Star Wars), Han Solo, Marvel Universe, Melissa Thomas, melty artz, Obi-Wan Kenobi, Padme Amidala, Paperman (Disney), Peter Parker, Rey (Star Wars), Rob Siebert, Robert Downey Jr., Spider-Man, Star Wars, Star Wars: Episode II - Attack of the Clones, Star Wars: The Clone Wars on 08/11/2018 by primaryignition.